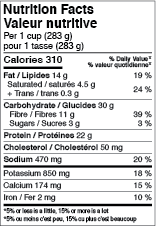 Barcode Graphics Inc (BGI), Canada’s largest barcode services provider, offers Canadian Nutrition Facts Tables (NFTs) through our NutrifactsGraphics division (see also U.S. NFPs). Manufacturers, consultants, designers, and prepress operations utilize our server to generate most of the NFT formats outlined in the Canadian Food and Drug Regulations (old and new). The BGI Server provides graphics by e-mail in EPS, BMP and PDF file formats. All calculations necessary to produce the table entries are performed by the server. The system is tailored to the needs of manufacturers, consultants, designers and prepress operations. To complement our NFT service, BGI also offers ADS Analysis Service. Our ADS Reports are driven by customer supplied Adobe Illustrator package designs, or PDF, dielines (send via e-mail). These reports calculate ADS per government regulations & guidelines, and provide a list of the NFT formats which are permitted on the package. Manufacturers, consultants, designers, and prepress operations find the BGI NFT Service a great way to cut costs, speed design time, guarantee compliance to Health Canada/CFIA Regulations, and eliminate human-error. Manufacturers can use the server’s database to store/manage nutrient information and produce NFT graphics, instantly and inexpensively. The system even allows the lab data, previously used to generate old regulation compliant NFTs, to generate new regulation compliant NFTs.